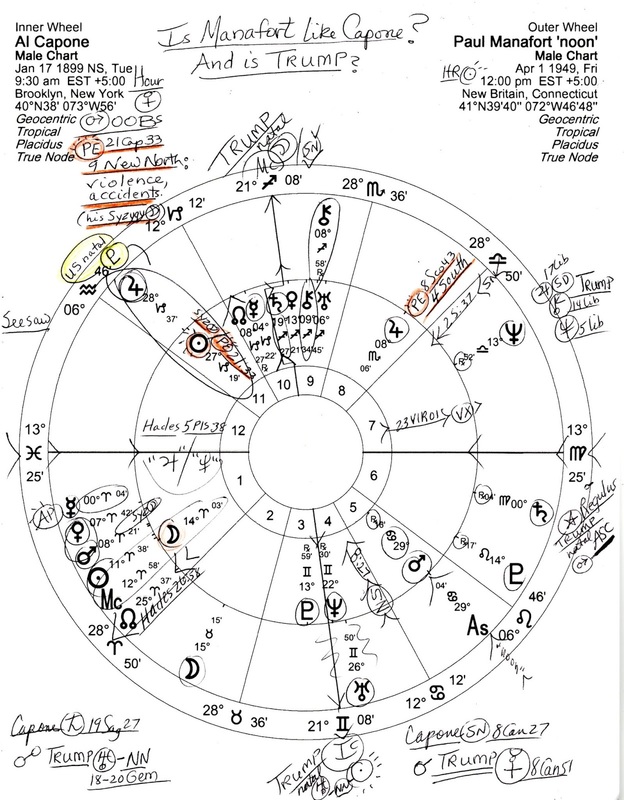 The more stand-out links are Manafort's natal Jupiter conjunct Capone's Sun (28Capricorn--conjunct US natal Pluto), Manafort's natal Chiron 8Sag58 Rx (the wound and blind spot) conjunct Capone's natal Chiron 9Sag34, Capone's natal Jupiter 8Sco06 conjunct Manafort's Prenatal Solar Eclipse degree (4 South themes = 'strong emotions about money and/or relationships; a sense of fated events; frustrating blocks; sudden desire to end a relationship'). I won't mention Capone's Mars 29Can16 (Rx, OOBs, and at critical degree) conjunct Manafort's Ascendant since Manafort's chart is speculatively set for 'noon'. 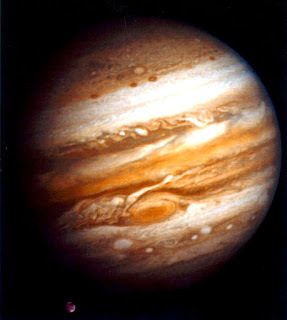 But we need no accurate birth time for Mr. Manafort to see Al Capone's Sun shining upon the natal Jupiter of extravagant spender and tax-dodger Paul Manafort during his current trial, thanks to the tweet-in-chief's (helpful?) efforts. Plus, you see that Manafort's natal Saturn 00Vir04 Rx conjoins royal star Regulus (success if revenge is avoided)--and conjoins Trump's natal Ascendant and, by extension, his rising Mars in Leo. This link suggests that Manafort will 'stick' (Saturn) with Trump (ASC) and not turn state's evidence, even if convicted, but we'll see since 69-year-old Manafort's prospect of dying in prison may be a prison cell too far. 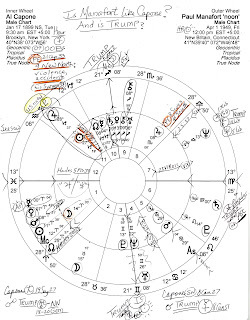 Also note that Al Capone's Syzygy Moon is his Prenatal Eclipse ('PE') 21Cap33 in the violent 9 New North Saros Series (conjunct Trump's natal Vertex!) 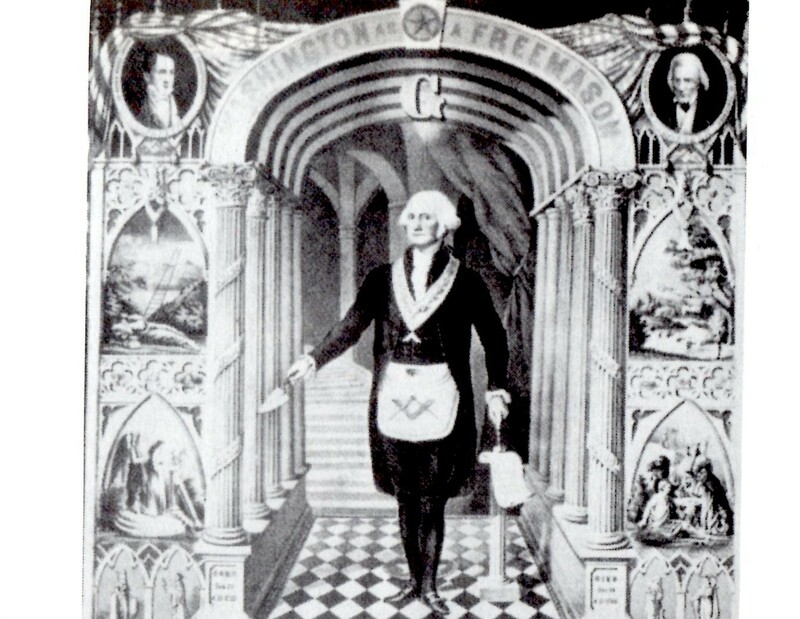 and is the same series as that of Alexander Hamilton's PE, as already discussed. 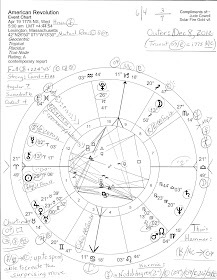 Now here's a brief bio plus the natal chart of Al Capone if you wish a peek at his chart without my scribbles. And of course The Tower Eclipse of August 11, 2018 is affecting events already and may have much more to 'say' about the whole sordid mess--or in quick Uranian fashion may put an end to it!